Naturally slow hickory smoked for extraordinary flavor. Just right for family dinners or sliced for sandwiches. Serve warm or cold. 3-4 lbs. Serves about 12. 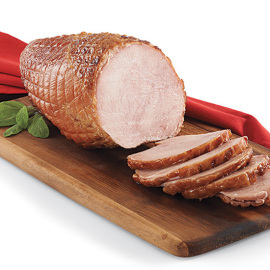 Your fully cooked boneless smoked turkey breast has been flash frozen to lock in natural flavor, ships with dry ice in a recyclable Styrofoam cooler and may arrive frozen or partially thawed. Please keep frozen until ready to use.